The second is this site for maps and aerial photographs along the British section of the Western Front. Along with this from the Imperial War Museum. The reason that aerial photography, maps and aircraft development are connected was that the airplane was the eyes of the various armies. The photographs, taken at typically great risk, were the essential tools for knowing just what the enemy was doing and the strength of his defenses and troop formations. 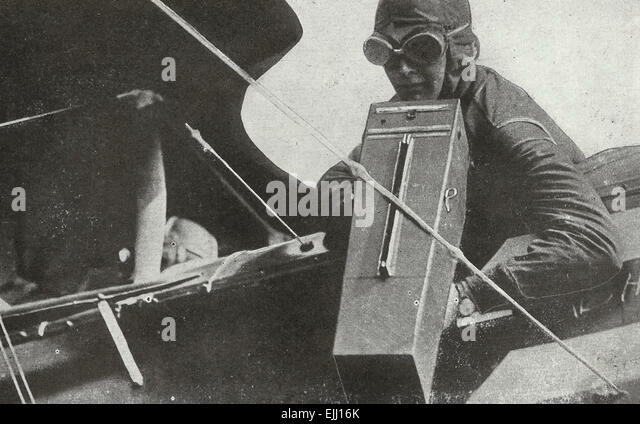 When WW1 started powered flight was barely ten years old and the technology was still in it’s infancy. 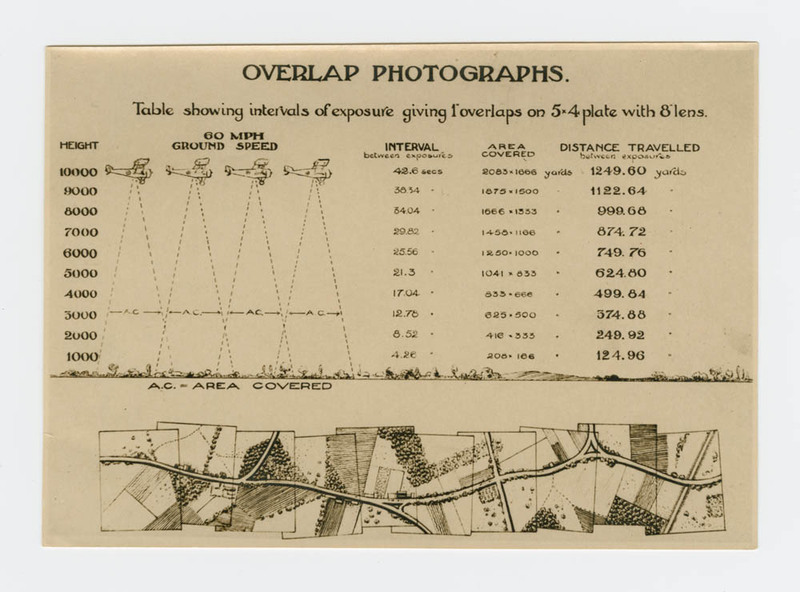 At the beginning of the war all the participants had experimented with aerial photography and the advantages and the potential uses of photographs were generally known. The reason that airplanes were first used for military purposes wasn’t to bomb or strafe helpless troops on the ground, but to observe what the troops were doing. Even as the war got started, this observation became crucial. It was observation from the air that told British and French Generals that the German forces were divided and led directly to the counter offensive that led to the battle of the Marne and put paid to the Shleifen Plan. Aerial reconnaissance was far faster than cavalry and could see far more than a troop of cavalry. For the first time general had eyes that could see everything. When the war started the only kind of aircraft flying were the observation planes. At first the pilots made oral reports, but using aerial photography soon became the preferred method aerial observation because that allowed commanders to see everything including things that the pilot might not think to report or nobody knew to be looking for. Some of the early aircraft in the war were not much more than a pair of wings, a small cockpit for the pilot and observer and a big engine. While the engine was big, it really wasn’t all that powerful. Early Twentieth Century engines were low RPM, large displacement machines that in order to get the horsepower requirements from the fuels available in WW1 and their lower octanes, had to be quite large, with low power to weight ratios. Which meant that the aircraft tended to be able to carry itself, the engine and not much else at the beginning of the war. By the end of the war, power to weight ratios went from terrible to just pathetic, but reliability was still an issue. Early in the war the aircraft of both sides would fly by each other as they took their photos with little more than a wave at each other. Soon though, somebody realized that taking the enemy’s eyes out might be a good thing. It started with service pistols and other small arms, thrown objects and even hooks trying to damage the other guys aircraft. The machine gun, typically lightened versions of ground weapons or light machine guns like the Lewis Gun became the weapon of choice for the intrepid soldiers trying to make the observation plane’s job more difficult. Thus began the back and forth with about a three month oscillation battle for control of the skies and the ability to see what the enemy was doing. The observation planes, their crews, and their dangerous work haven’t received the attention that the bold fighter pilots and their daring do have since the war ended. Yet the work that they did was critical to the conduct of the war. For all the bloody mess and life and death drama of the fighter pilots, what they did was important for one thing. To keep the enemy off the back of the observation planes for the amount of time it took for the observers to get the shots that meant life or death for the thousands in the trenches. Because in order to get clear photographs, the photographs that had the kind of resolution that would clearly show enemy actions, you needed to fly straight, level and slow for as long as you could. While the pilot was flying slow and straight the observer was manipulating a camera that was large, heavy and used glass plates. Which meant that if the plane was attacked the observer could be looking down with trying to deal with a camera that was, at best incredibly fragile and couldn’t just be dropped. How dangerous was it? Well here’s a list of the victories by Snoopy’s nemesis the Red Baron. The thing is that Baron von Richthofen would probably ignore the intrepid flying ace in favor of his real prey, observer aircraft. Look at the list of victories. Mostly two seater observer types. The thing is that, for a WW1 vintage observer the most dangerous time was when it was doing it’s job. Because not only was it required to fly level and slow, it could not even defend itself because the observer was running the camera and could not use the tail gun. That is if he even saw the enemy approaching with his head in the viewfinder of the camera. I suspect that most of the medals gained by fighter pilots on both sides of the war were earned by shooting down aircraft that could not even defend themselves. The reason that the patrols were at dawn was because dawn light provides contrast for photography, so that’s when the observers would go up to get their shots. So that’s when the fighters started their sweeps, looking for enemy observation planes doing their work. The photos that the men below are pasting up on the wall here were possibly bought with true courage and blood. Courage that got little recognition. While the fighter pilots got medals and promotions for shooting down other aircraft, the typical observer aircraft crew got not so much for doing their dangerous work. At least while they were alive. 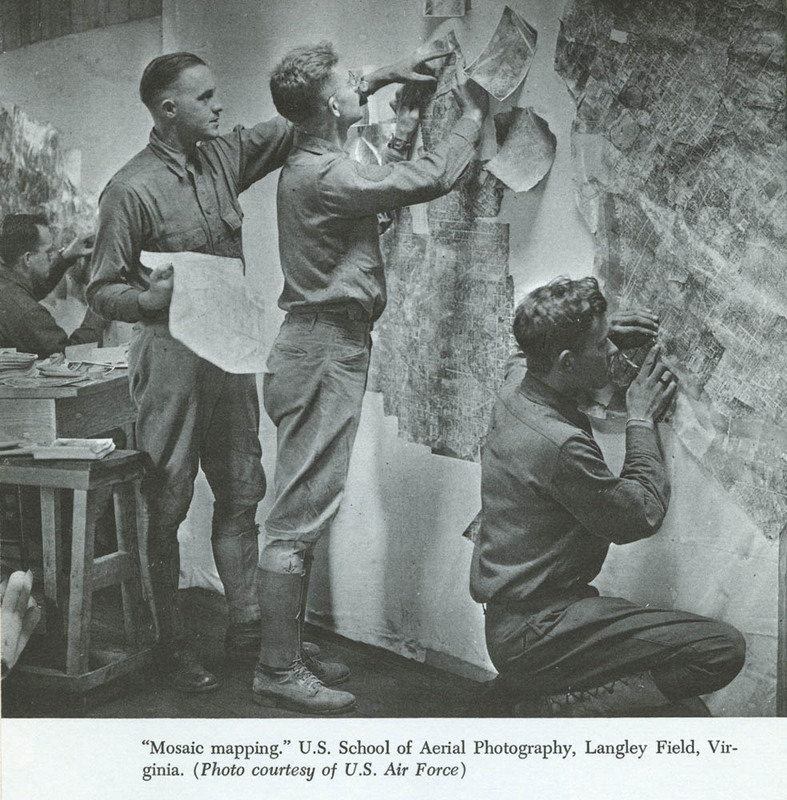 Here’s some links about aerial photography in world war 1. My Pinterest board on WW1 aerial photography. Various sites with camera pics. The information that the observer pilots brought back was crucial for planning operations and making maps and models like the one below. Vimy Ridge was a success in large part because the BEF had the information possible to make maps and models that could make the situation on ground clear even when ground base scouting was impossible. 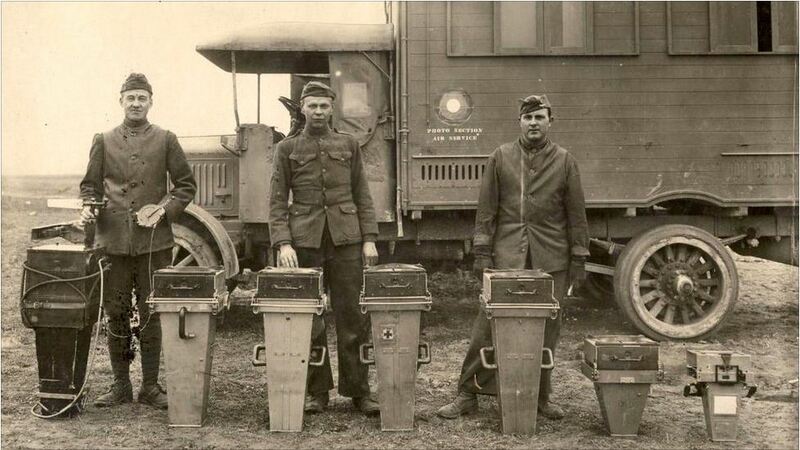 Aerial photography and the pilots and observers get fairly little attention in most military histories of WW1. Certainly the use of photography for intelligence, planning and counter battery fire was first done in WW1 and the use of aerial photography and the intelligence it provided was a crucial part of operations during the war. Yet, in most general histories of the war, when the war in the air is discussed it’s fighters, bombers and the German Zeppelins with aerial photography typically relegated to a few, not very clear pictures. Which is a shame because in those thousands of pictures the entire story of the war could probably be told, at least on the Western Front. I suspect that in the archives of all the combatant nations are thousands of pictures, taken at great risk and lives, delivered to gain victory or record the defeats. There don’t seem to be a great deal of recognition for the brave pilots and observers who going up in aircraft that were little more than kites with engines attached went up day after and got the information that the troops on the ground desperately needed . 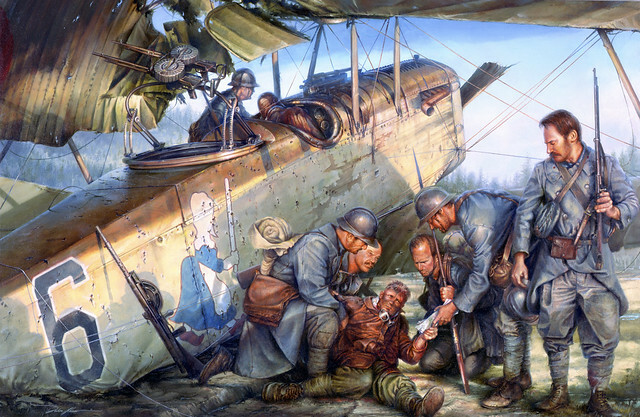 Pilots who were not glory hounds, but simply were, like my great uncle Roscoe, doing a job that needed to be done did their dangerous work not for themselves, but for the people in the trenches and the hope that they could help ned the war faster so that everybody could go home. Some books about WW1 and aerial photography.